I’m pleased to report that everything I like about the clarinet and alto mouthpieces is true of the tenor mouthpieces as well: these are well-made, utterly consistent, easy-to-play, affordable, versatile mouthpieces. Like the clarinet and alto pieces, the Select Jazz tenor mouthpiece is going to be my new mouthpiece for the foreseeable future. I like to be as low-fuss as possible about my gear. This is a sub-$200 mouthpiece, fully machine-made to fine tolerances, by a major woodwind accessory company. That means if I break or lose mine, I can quickly and easily get another that plays virtually identically from just about any online or brick-and-mortar music store. (Soon; the tenor mouthpieces don’t seem to be in many stores yet.) Check out my previous reviews for more in-depth discussion about that—in short, the days of having to order a half-dozen and pick the best one are gone. 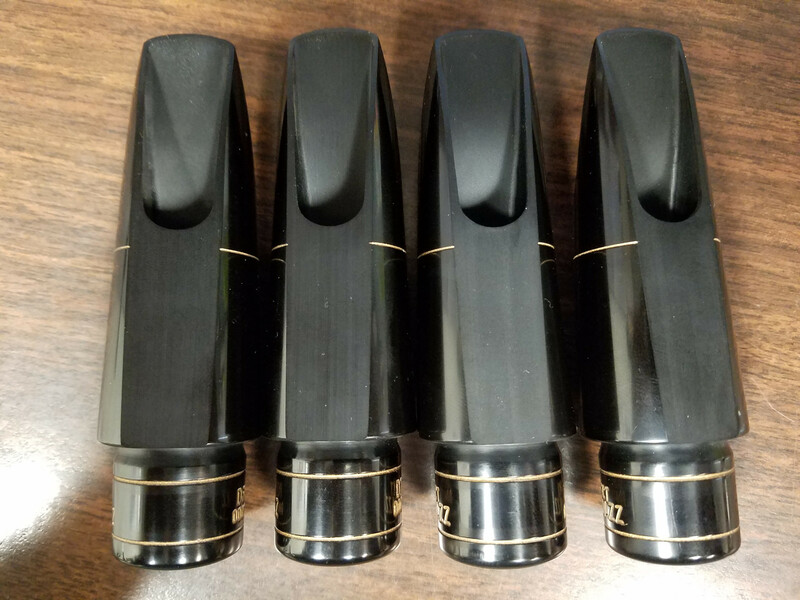 The Select Jazz tenor mouthpiece is currently available in a medium chamber and medium facing, with tip openings from 6 (2.54mm/.100”) to 9 (2.92mm/.115”). I’ve been wanting to move to a little smaller tip opening, and the 6 is just what I was looking for. The tip openings differ in the ways you would expect. The 6 likes a medium- or medium-soft strength reed, and the 9 needs a medium-soft or soft. The smaller openings are very slightly mellower in tone, softer in volume, and oriented toward stability rather than flexibility, while the larger ones are brighter, louder, and more flexible/less stable, but the differences really are pretty minor. The 6 is my favorite, but I could use the 9 on a gig in a pinch. Choosing your tip opening will probably be more a matter of comfort zone than a question of differences in sound or application. My previous mouthpiece was a slightly older model Vandoren V16 metal mouthpiece, the T75 (2.67mm/.105″, I think). It served me well for quite a few years, but recently I’ve been less satisfied with its difficult low notes and overall edginess. (After having it for a few years the gold plating started to get some discolored spots, and ultimately got some pitting on the table, so it may not be playing as well as it once did.) Playing hard rubber for jazz on tenor is actually new for me—I’ve played a string of metal mouthpieces since high school—but the transition to the Select Jazz has been seamless. Eyes closed, I don’t think I could tell the difference material-wise. For tenor in particular I want a mouthpiece that can do lots of things—a sweeter, mellower sound for small-group cocktail gigs, a punchier, gutsier sound for amplified rock and blues, precise articulation and rock-steady intonation for studio playing. The Select Jazz has a nice middle-of-the-road quality that moves easily between straight-ahead jazz and funkier sounds. I find that at a scream I don’t get quite as much bite in the tone as I do with the V16, but I was pleasantly surprised at the amount of bottom end in the sound at maximum volume. In other words, the V16 gets bright and aggressive when I push it, but the Select Jazz just gets big and powerful. I’m liking the tradeoff. The Select Jazz also wins hands down for ease of playing (against the V16, which I originally selected for its ease of playing). I could just about play a classical recital on the #6 if I had to—the articulation and response are easy from low B-flat up into the altissimo. Like the V16, it strikes a nice balance between stability and flexibility. It’s easy to play in tune, but there’s also plenty of room to bend the pitch around when I want to. I’m not going to do a thorough play-test comparison this time, because I don’t think it’s really necessary. My V16 is an old model, in poor shape, and metal, so the comparison isn’t really fair and they are perhaps somewhat different animals anyway. But here’s a quick demo of the 6, moving through a few different styles. (It was supposed to be one uninterrupted take, but I ended up having to re-record the last segment standing a little farther from the mic.) First a snippet of Body and Soul, then a few bars of a Brecker tune that I can never remember the name of, then Night Train, then the horn break from Sir Duke. I don’t see myself as a guy who gets snobby about brands, but D’Addario’s pro-line mouthpieces have hit the mark for me 100% so far. Looking forward to what’s next. You sound great on this piece, Brett! Wish you had shown a photo of the inside. 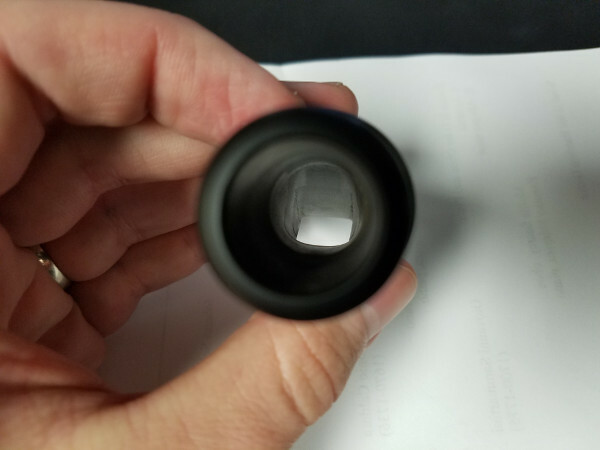 This looks like a low baffle, but what is the shape of the inner chamber? Thanks so much for including us in your thorough, yet always approachable, reviews, Bret! We’re honored that you took the time to write about the Select Jazz tenor pieces and we would like to invite anyone who is seeking more info on them to be in touch: kristen.mckeon@daddario.com. For those who may be curious, our lead artist on the project was the wonderful and talented, Jeff Coffin. Happy music making to all! I currently play on a Select Jazz alto piece, which I find tends to chew up my cork a bit. Does this mouthpiece also have this issue? 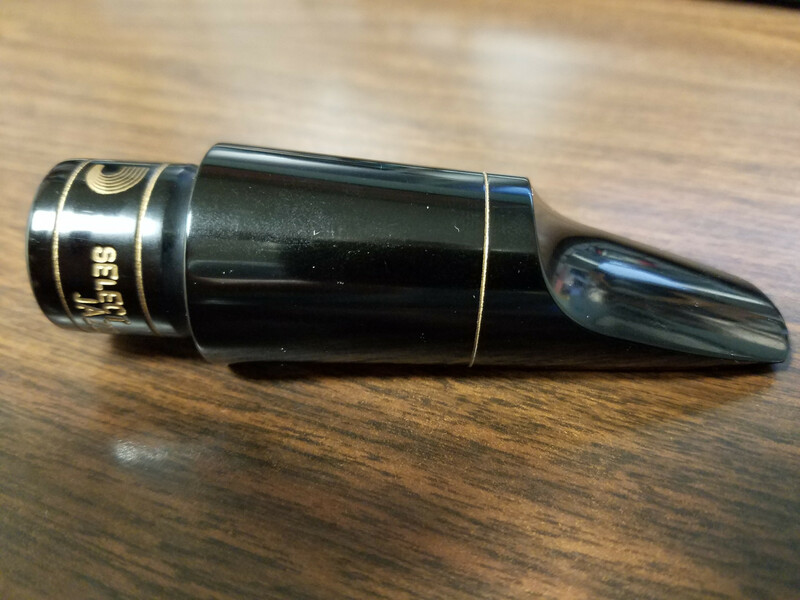 I found the alto mouthpiece to be somewhat tight on the cork, if that’s what you mean, compared to the Vandoren I was using previously. The tenor mouthpiece seems to fit similarly to the Vandoren.